Every night from 9:00-9:45 Eastern time the Monsey NaNachs are live on internet radio. We discuss everything its really exciting & enjoyable. We just started 3 days ago & it will get better. Here is the link enjoy listening to Shalom Aron, Shlomo, Aron W, Smacky, and myself. We will be taking radio phone calls soon. 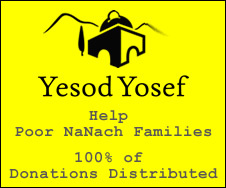 http://www.jewishradionetwork.net/indexmain.html NaNach! Hope to be able to participate! What happened, can't hear you guys? Also if you're already getting together, why don't you do it on webcam, check out paltalk, that would be amazing!